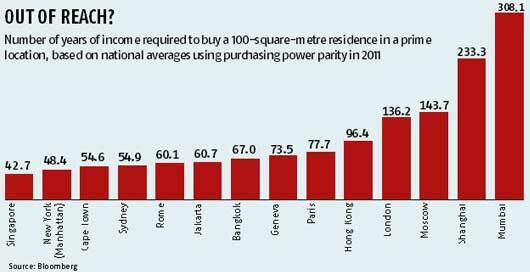 The chart below shows a 100-square-metre luxury residence in Mumbai costs about Rs 5.8 crore, or 308 times the average annual income in India, based on calculations from a housing index compiled using 63 markets by Knight Frank LLP and income estimates of the US Central Intelligence Agency for purchasing-power parity in 2011. Thus as per the calculation an average Indian would need to work for three hundred years to pay for a luxury home in Mumbai, making the city the least affordable in the world for locals. Home prices at Prime location in Mumbai averaged $11,400 (Rs 581,400) a square meter as on 31 December 2011, while India’s per capita purchasing power was $3,700 (Rs 188,700), the data show. Residential prices in India, calculated using an average in major cities nationwide, rose 284 per cent in real terms since 2001 after adjusting for consumer price inflation.